In search for AUS 53 and possibly bringing her back to racing, could anyone please inform on her current location? The last info we had, was that she was last seen in Brisbane. I was Ben’s design partner for 7 months before he died, in 1988. We traded under the name of Lexcen, Lowe Yacht Design. I had worked for Ben for 6 years prior to becoming his partner. The hull lines for this particular design were done by me, for an earlier design, while he was still alive but slightly modified later for this design. The original lines had two hulls built from them – “Kamber” AUS 47 (a varnished hull like “Trilogy”) and “Kamber II” AUS 49 (a painted hull). 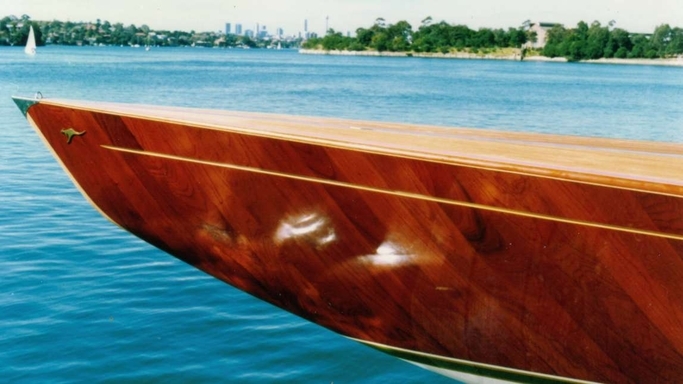 The original owners of “Trilogy” were – Andrew Hudson (Boatbuilder) Michael Lee (Sailmaker) and Jack Christoffersen (Marine Engineer) – hence the name “Trilogy”.